The Bombing of Tokyo (東京大空襲, Tōkyōdaikūshū), often referred to as a series of firebombing raids, was conducted as part of the air raids on Japan by the United States Army Air Forces during the Pacific campaigns of World War II. The US first mounted a small-scale raid on Tokyo in April 1942. Strategic bombing and urban area bombing began in 1944 after the long-range B-29 Superfortress bomber entered service, first deployed from China and thereafter the Mariana Islands. B-29 raids from those islands began on 17 November 1944, and lasted until 15 August 1945, the day Japan capitulated. The Operation Meetinghouse air raid of 9–10 March 1945 was later estimated to be the single most destructive bombing raid in history. 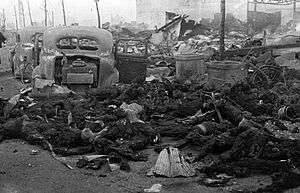 Charred remains of Japanese civilians after the firebombing of Tokyo on the night of 9–10 March 1945. The high altitude bombing attacks using general purpose bombs were observed to be ineffective by USAAF leaders due to high winds—later discovered to be the jet stream—which carried the bombs off target. Changing tactics to increase the damage, Curtis LeMay ordered the bombers to drop incendiary bombs to burn Japan's vulnerable wood-and-paper buildings. The first such raid was against Kobe on 4 February 1945. 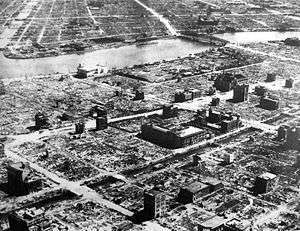 Tokyo was hit by incendiaries on 25 February 1945 when 174 B-29s flew a high altitude raid during daylight hours and destroyed around 643 acres (260 ha) (2.6 km2) of the snow-covered city, using 453.7 tons of mostly incendiaries with some fragmentation bombs. After this raid, LeMay ordered the B-29 bombers to attack again but at a relatively low altitude of 5,000 to 9,000 ft (1,500 to 2,700 m) and at night, because Japan's anti-aircraft artillery defenses were weakest in this altitude range, and the fighter defenses were ineffective at night. LeMay ordered all defensive guns but the tail gun removed from the B-29s so that the aircraft would be lighter and use less fuel. On the night of 9–10 March ("Operation Meetinghouse"), 334 B-29s took off to raid with 279 of them dropping 1,665 tons of bombs on Tokyo. The bombs were mostly the 500-pound (230 kg) E-46 cluster bomb which released 38 napalm-carrying M-69 incendiary bomblets at an altitude of 2,000–2,500 ft (610–760 m). The M-69s punched through thin roofing material or landed on the ground; in either case they ignited 3–5 seconds later, throwing out a jet of flaming napalm globs. A lesser number of M-47 incendiaries was also dropped: the M-47 was a 100-pound (45 kg) jelled-gasoline and white phosphorus bomb which ignited upon impact. In the first two hours of the raid, 226 of the attacking aircraft unloaded their bombs to overwhelm the city's fire defenses. The first B-29s to arrive dropped bombs in a large X pattern centered in Tokyo's densely populated working class district near the docks in both Koto and Chuo city wards on the water; later aircraft simply aimed near this flaming X. The individual fires caused by the bombs joined to create a general conflagration, which would have been classified as a firestorm but for prevailing winds gusting at 17 to 28 mph (27 to 45 km/h). Approximately 15.8 square miles (4,090 ha) of the city were destroyed and some 100,000 people are estimated to have died. A grand total of 282 of the 339 B-29s launched for "Meetinghouse" made it to the target, 27 of which failed to return due to enemy action, mechanical failure, or being caught in updrafts caused by the massive fires. Damage to Tokyo's heavy industry was slight until firebombing destroyed much of the light industry that was used as an integral source for small machine parts and time-intensive processes. 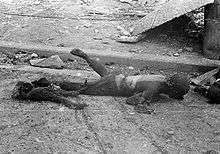 Firebombing also killed or made homeless many workers who had been taking part in war industry. Over 50% of Tokyo's industry was spread out among residential and commercial neighborhoods; firebombing cut the whole city's output in half. The destruction and damage was especially severe in the eastern areas of the city. 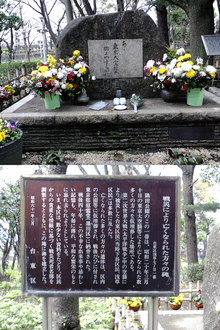 The Operation Meetinghouse firebombing of Tokyo on the night of 9 March 1945 was the single deadliest air raid of World War II, greater than Dresden, Hiroshima, or Nagasaki as single events. In 2007, Japanese Prime Minister Abe Shinzō apologized in print, acknowledging Japan's guilt in the bombing of Chinese cities and civilians beginning in 1938. He wrote that the Japanese government should have surrendered as soon as losing the war was inevitable, an action that would have prevented Tokyo from being firebombed in March 1945, as well as subsequent bombings of other cities. However, in 2013, during his second term as prime minister, Abe's cabinet stated that the raids were "incompatible with humanitarianism, which is one of the foundations of international law", but also noted that it is difficult to argue that the raids were illegal under the international laws of the time. 9 March 1945: 334 B-29s dropping incendiaries destroy 267,000 buildings; 25% of city (Operation Meetinghouse) killing some 100,000. 20 July 1945: 1 B-29 drops a Pumpkin bomb (bomb with same ballistics as the Fat Man nuclear bomb) through overcast aiming at but missing the Imperial Palace. 16–17 February 1945: carrier-based aircraft, including dive bombers, escorted by Hellcat fighters attacked Tokyo. Over two days, over 1500 American planes and hundreds of Japanese planes were in the air. "By the end of February 17, more than five hundred Japanese planes, both on the ground and in the air, had been lost, and Japan's aircraft works had been badly hit. The Americans lost eighty planes." 18 August 1945: Last U.S. air combat casualty of World War II occurred during mission 230 A-8, when two Consolidated B-32 Dominators of the 386th Bomb Squadron, 312th Bomb Group, launched from Yontan Airfield, Okinawa, for a photo reconnaissance run over Tokyo, Japan. Both bombers were attacked by several Japanese fighters of both the 302nd Naval Air Group at Atsugi and the Yokosuka Air Group that made 10 gunnery passes. Japanese IJNAS aces Sadamu Komachi and Saburō Sakai were part of this attack. B-32 piloted by 1st Lt. John R. Anderson, was hit at 20,000 feet; cannon fire knocked out number two (port inner) engine, and three crew were injured, including Sgt. Anthony J. Marchione, 19, of the 20th Reconnaissance Squadron, who took 20 mm hit to the chest and died 30 minutes later. Tail gunner Sgt. John Houston destroyed one attacker. Lead bomber, Consolidated B-32-20-CF Dominator, 42-108532, "Hobo Queen II", piloted by 1st Lt. James Klein, was not seriously damaged but second Consolidated B-32-35-CF Dominator, 42-108578, lost an engine, had upper turret knocked out of action, and partially lost rudder control. Both bombers landed at Yontan Airfield just past ~1800 hrs. having survived the last air combat of the Pacific war. The following day, propellers were removed from Japanese aircraft as part of the surrender agreement. Marchione was buried on Okinawa on 19 August, his body being returned to his Pottstown, Pennsylvania home on 18 March 1949. He was interred in St. Aloysius Old Cemetery with full military honors. "Hobo Queen II" was dismantled at Yonton Airfield following a 9 September nosegear collapse and damage during lifting. B-32, 42-108578, was scrapped at Kingman, Arizona after the war. ↑ Craven, Wesley Frank, and James Lea Cate, eds. The Army Air Forces in World War II, Volume Five, the Pacific: Matterhorn to Nagasaki June 1944 to August 1945. Chicago: University of Chicago Press, 1953, page 558. 1 2 "9 March 1945: Burning the Heart Out of the Enemy". Wired. Condé Nast Digital. 9 March 2011. Retrieved 8 August 2011. ↑ Shapiro, Isaac (2009). Edokko: Growing Up a Foreigner in Wartime Japan. iUniverse. p. 115. ISBN 1-4401-4124-X. ↑ Beevor, Antony (2012). The Second World War. New York: Back Bay Books. p. 698. ISBN 978-0-316-02375-7. ↑ Video: B-29s Rule Jap Skies,1944/12/18 (1944). Universal Newsreel. 1944. Retrieved 20 February 2012. ↑ Morgan, Robert; Powers, Ron. The Man Who Flew The Memphis Belle. Dutton. p. 279. ISBN 0-525-94610-1. ↑ Hopkins, William B. (2009). The Pacific War: The Strategy, Politics, and Players That Won the War. Zenith Imprint. p. 322. ISBN 0-7603-3435-8. ↑ Bradley, F.J. (1999). No Strategic Targets Left. Turner Publishing. p. 33. ISBN 9781563114830. ↑ Miller, Donald L.; Commager, Henry Steele (2001). The Story of World War II. New York: Simon and Schuster. pp. 447–449. ISBN 9780743227186. ↑ Crane, Conrad C. "The War: Firebombing (Germany & Japan)." PBS. Accessed 24 August 2014. ↑ Bradley 1999, pp. 34–35. ↑ Rodden, Robert M.; John, Floyd I.; Laurino, Richard (May 1965). Exploratory Analysis of Firestorms., Stanford Research Institute, pp. 39, 40, 53–54. Office of Civil Defense, Department of the Army, Washington D.C.
↑ David McNeill. The night hell fell from the sky. Japan Focus, 10 March 2005 Archived 5 December 2008 at the Wayback Machine..
↑ Morgan, Robert; Powers, Ron. The Man Who Flew The Memphis Belle. Dutton. p. 314. ISBN 0-525-94610-1. ↑ Bradley, F. J. No Strategic Targets Left. "Contribution of Major Fire Raids Toward Ending WWII" p. 38. Turner Publishing Company, limited edition. ISBN 1-56311-483-6. 1 2 Selden, Mark (May 2, 2007). "A Forgotten Holocaust: US Bombing Strategy, the Destruction of Japanese Cities & the American Way of War from World War II to Iraq". Japan Focus. Retrieved 18 July 2015. ↑ Miller 2001, p. 456. ↑ Andre Sorensen. The Making of Urban Japan: Cities and Planning from Edo to the Twenty First Century RoutledgeCurzon, 2004. ISBN 0-415-35422-6. ↑ Aukema Justin, "Author sees parallels between prewar, nuclear indoctrination", Japan Times, 20 March 2012, p. 12. ↑ Karacas, Cary (2010). "Fire Bombings and Forgotten Civilians: The Lawsuit Seeking Compensation for Victims of the Tokyo Air Raids 焼夷弾空襲と忘れられた被災市民―東京大空襲犠牲者による損害賠償請求訴訟". JapanFocus.org. ISSN 1557-4660. 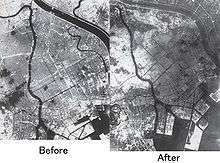 ↑ "Japanese government says 1945 Tokyo bombing was 'against humanitarian principles'". Japan Daily News. Mainichi Shimbun. 7 May 2013. Retrieved 22 November 2013. ↑ "東京大空襲で答弁書 「人道主義に合致せず」". 47NEWS. 共同通信社. 7 May 2013. Retrieved 22 November 2013. ↑ "東京大空襲、国を提訴 遺族ら12億円賠償請求". 47NEWS. Kyodo News. 9 March 2007. Retrieved 22 November 2013. ↑ "東京大空襲の賠償認めず 「救済対象者の選別困難」". 47NEWS. Kyodo News. 14 December 2009. Retrieved 22 November 2013. ↑ "東京大空襲で原告敗訴が確定 最高裁が上告退ける". 47NEWS. Kyodo News. 9 May 2013. Retrieved 22 November 2013. 1 2 3 4 5 Hillenbrand, Laura (2010). Unbroken. New York: Random House. p. 473. ISBN 978-1-4000-6416-8. ↑ Hillenbrand (2010), pp. 261-262. 1 2 Hillenbrand (2010), p. 263. ↑ Hillenbrand (2010), p. 274. ↑ Tactical Mission Report 38. 21st Bomber Command. 1945. 1 2 U.S. Army Air Forces in World War II: Combat Chronology. March 1945. Air Force Historical Studies Office. Retrieved 3 March 2009. ↑ Norman Polmar. The Enola Gay: The B-29 That Dropped the Atomic Bomb on Hiroshima, pp. 24. Potomac Books (2004) ISBN 1-57488-836-6. ↑ Hillenbrand (2010), pp. 273-274. ↑ The Last to Die | Military Aviation | Air & Space Magazine. Airspacemag.com. Retrieved on 5 August 2010. ↑ 1942 USAAF Serial Numbers (42-91974 to 42-110188). Joebaugher.com. Retrieved on 5 August 2010.